My name is Dave and I am in the Cleveland Ohio area (east side, for those of you familiar with the local preferences here.) I have a military background and have always loved martial history. In my college days I was given the gift of an Arab dagger which I have kept with me for the past 30 years, occasionally pulling it out to admire. After leaving the military, I entered the world of international business, having lived in Europe for years and spent a lot of time in Russia, the Middle East, and Central Europe. About 9 years ago I accepted a new position with a focus on Asia. With all of my travel to that region, I re-acquired my interest in the regional ethnic daggers, and when time permitted, would occasionally search for something in the local markets. Last year my boss resigned and I was handed Japan to manage for our products and distribution. I ended up going over and staying there for three months. Most of you can now fill in the transition to an interest and respect for Nihonto blades, which far and away surpass anything else I have seen. I have spent hours in some of the sword stores and so have a sense of the beauty and attraction of the genuine blades. I genuinely want to acquire a blade, but have been reluctant to just go out and buy one without fully understanding what I am actually buying. So I have decided to just lurk on this site and absorb the knowledge, and have now purchased several of the recommended books to begin learning in more depth about the various nuances and aspects before I really decide to part with money. Then of course, I have to convince my wife. (Any advice on that aspect gratefully accepted). I also recently was asked about a WW2 sword that was found in a closet, and am grateful for the advice given on this site. So thanks to all of you for allowing me to absorb your knowledge and to watch your always interesting discussions. Some day I hope to have enough knowledge to make a rational comment myself. But I suspect that is a bit far off in the future. Hi all - I am Charlie from Los Angeles. I have had the good fortune to find this board and get great advise on my meager collection. I am 60 and just recently became interested in nihonto. My journey began with an inherited a wak with shirasaya and a few other related pieces about 15 years ago but just put them aside in the silk bag they were in and forgot about them. Recently, after watching a NOVA show on nihonto I found them again and became fascinated in the stories behind nihonto in general and these pieces in particular. I fear I have become addicted - doing research, buying books, going to shows, etc. I truly appreciate all the kind assistance and information I have received on this board. If you are going to climb a mountain, begin at the summit! Hello All! Let me first say this site seems to be incredible and the members have been very helpful so far. My names Mike..Ive been around a history buff/avid collector since the day I was born(My dad)! !ive had a REAL interest and appreciation for History for about 2 years and have spent about a year diveing into WW2 Japanese items. My grand father was an officer and served in the 77th Division during the war and was on Guam and later Leyte where he was serious wounded. On Guam he captured one of the first swords by his regiment (306th Regiment). It wasnt anything special but as it was brought back by my grandpa and we know when and how it is by far the best sword. My father has been collecting Napoleonic items since a teenanger and I recently have turned him onto Japanese miilitaria and hasnt looked back since haha. I really enjoy collecting as I belive it truely is a gateway to get away from stress and daily problems and bad news....just head home...go into your "War room" open a book or log onto the forums and wham the troubles in life seem to dissapear. This is a great hobby we have and im glad to now be a member of this great site and look foward in asking questions(please dont be upset if i ask what seems like obvious ones as I am a novice),making friends, roaming the posts,and shareing what I can. See you all on the forum! Take care. Being someting of an unlearned but ancient collector. Greetings Henry, Thanks for the welcome and advice ,since ive joined Ive been reading up on blades and culture and learning about things I never knew before,some great info on here and im thrilled im now turned onto it Take care all! My name is Bob Hunter and I have been a collector of militaria for over 30 years but only recently came into Japanese art swords. I find it a fascinating and complex field of study. For the moment I'm reading a lot and I will be here on the forum, "lurking with extreme intent" until I shed some of my ignorance. Hi Bob - from one nihonto "newbie" to another - it is a slippery slope you have embarked upon! Welcome! I am certain you will find the members of this board extremely helpful as you lurk and learn. Hello my name is Adrian (Ade) I've collected militaria for 40 years now, two maybe conflicting spheres which you might find odd being British Victorian campaign medals primarily Crimea and Third Reich edged weapons. Well I have a hankering for a nice genuine Katana, but as a complete ignoramus I'm going to have to ask you guys lots of questions before I purchase as I intend spending a fair amount say between $8-10k, I reckon I should find a nice example within that price range, but at the moment I'm not sure which way to go. I'm a 'condition freak' on everything I buy (I also collect general antiques as well) so for a starter is it better to go for a really old blade that has been restored and with fresh fittings or to go for something comparatively 'Young'. From what I've seen so far on dealer sites swords made as late as the 1960's can command prices as high as 600 year old ones, so rather confusing at the moment? Well thanks for reading this and I hope I can become a useful member in the future. Hmm, where to begin? With hindsight being 20/20, from my perspective a new collector should begin by studying Japanese-nihonto history through at least the time of when the Gokaden was established. This would at least give you a basic foundation to work from in deciding what your personal preference in choosing a nihonto might be, no matter what time period the sword was made in. The second point I would emphasize is learn what kantei is all about. Thirdly, look at as many nihonto from all time periods and traditions as possible before choosing. Fourth, for someone just starting out and prepared to spend a good chunk of change on a sword, learn what the different levels of NBTHK, NTHK origami represent. Thank you Franco, I will certainly not be rushing into buying anything without expert guidance, I made those sort of mistakes as a much younger collector. I most certainly will be doing much research before making any commitment, from the little knowledge I have it seems that this area is as much a minefield as any other militaria interest, however, being now retired from the rat race there is ample time for study. I've been 'inactive' in the Nihonto world for some years now, but I see some familiar names. I remember when Jeff Harshman and I used to drive to Denver for the Colorado Token Kai meetings in Sakura Square, back when Dr. Takahashi and Gary Montgomery were still with us. Welcome to the Messageboard. I have used your Tosho database for a long time. It is still one of my favourites. HAve there been any updates? The JSSUS is still looking for good material to publish. Please give it some thought! I'm eager to have a look around and hopefully learn a lot from you guys. Welcome K. Enjoy yourself and remember to join your local sword club, build a library and a vocabulary and read, and read and read. Go to as many shows as you can handle swords...and did I mention read? I would need to spend much more time dedicated to studying them to feel comfortable even thinking about buying one. A very proper attitude and wise approach I think the first time that you view and study "good swords" in "excellent polish" first hand, will set your collecting perspective forever more. Even if turns out that you never end up owning one. I became interested in Japanese Blades , believe it or not, the first time I saw Highlander! Don't laugh... OK, Laugh!!! I collect pretty much anything "weapon" related. Randall Made Knives and antique firearms such as Colt Single Action Revolvers, German Lugers and Civil War Long-guns have been my latest addictions. That is until now! I'm 46 and a former Marine (MOS:8541... hence the name) My first blade was a fake Chinese P.O.S. I bought a couple of months ago for $79.00 on Ebay. I thought I hit the Jackpot! Yea, Right! Believe it or not that's what really hooked me. I started reading everything I could find and spend most of my waking hours reading about Japanese Blades... Old (Nihonto) Japanese Blades. Most of the terminology escapes me at the moment but I'm learning more and more every day. I just bought my first legitimate Japanese blades this week and one of them may be going back. I'll get into that in another post. Anyway, I live in Central Florida and have lived in Florida since 1978. I know most of the cool stuff to do around here so if anyone's coming down feel free to contact me and I'll help any way I can. Guess that's about it for now. Thanks for your attention! Welcome to the board. Former marine as well, but not as cool MOS, (I ant say'n). Your one of the lucky ones as one of the higher end shows is in Tampa (Feb of each year) and your going to see some of the really great nihonto there. remember baby steps and we all, well most of us went thru the learning process of one low end sword up the latter to better stuff. Have fun and if you need help withsomething just PM me. Great folks in Florida. I love the Florida show. I'll see you there. My name is David and I have been reading the board for a while now so I have just created an account at long last. I`m from Queensland Australia but i currently live in Tochigi prefecture Japan. I`ve been interested in Nihonto for a while now but only started collecting last year so I`m still learning especially when it comes to specific smiths names and style preferences. Therefore i`m looking forward to learning heaps more espcially about sword Kanji. 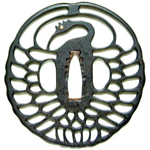 I`m currently interested in Wakazashi, Tsuba and especailly blades with uncommon hamon patterns. My favorite sword is currently a Meiji period police sword. Isn't "here" just "there" without a "t"?? My name is Brian Kennedy and I recently moved back to California after having lived in Taiwan for the past 15 years. As folks might know Taiwan was a colony of Japan from 1895 to 1945 and many Taiwanese served (drafted or conscripted, however one describes it) in the Japanese military during WW-2. I only currently own one Japanese machine made sword. The inscription, in english on the leather scabbard, said "taken in Shanghai China October 1945". When I first got the sword (for $50 at a swap meet) it still had a few scraps of the ray skin handle material. My wife and I have written two books on Chinese martial arts history. One came out several years ago, it was titled Chinese Martial Arts Training Manuals: A Historical Survey. The second one will be released in June of next year. It is about the Jingwu Association. Over the years I have done a bit of various martial arts. I started back in 1976 with traditional Chinese martial arts. Then over the years did a range of things including tai chi, western boxing and most recently judo. In fact I just got out of my cast after having broke my foot doing judo! At 51 I maybe a wee bit old for contact martial arts but I wanted to give it a go. I look forward to meeting and talking with folks here. Welcome, Brian! If you are anywhere near the San Francisco area please consider joining our local club. Thanks much for the warm welcome. It would be great to join you folks but alas, I am down in San Diego. My name is Jan-Wouter Thijssen. I live in the Netherlands and I am 32 years of age. I work as a Health, Safety & Environment Manager at a shipping company. Together with my father I've collected antique firearms. When we became members of the Society of Dutch arms collectors and went to their meeting for the first time, I was confronted with some beautiful Japanese art-swords. Of course as a kid, everybody liked the "samurai-swords", but now I could see their real beauty and the beautiful history behind them. My first Japanese sword I purchased without any knowledge whatsoever. It seems I was a little bit lucky. It was a simple sword without signature or stamps in WO II Koshirae but according to Mr. Duindam from Token Sugita Europe, a genuine Japanese sword. A little while later I bought my second sword, a wakizashi with NTHK kanteisho attributed to Aizu Michitoki. In my opinion beautiful, but nothing special. I hope to learn a lot on this forum. I see "newbies" on this site using terminology I haven't even heard of yet, so I have lots to learn. Hello all. Age 26. Long time lurker here (about 5 years). Have been holding my foolish tongue and reading pretty much everything I can digest on Japanese swords and their fittings in that time. Started from complete ignorance and have moved up to a proud current state of mostly ignorant. Got into all this through an inexplicable interest in far eastern art and culture from a very young age, which led me to study Japanese martial arts (shotokan and aikido mainly) and then mandarin chinese language at university. Held my first nihonto in an aikido class aged about 17 but then forgot about them (put them out of my mind) for a good 5 years. Not sure exactly what brought the bug on proper, but it 'got me good' and now i think im too far gone...suspect it will be a chronic affliction. I want to thank everyone who has contributed (and continues to contribute) so much to this website from which I have learned a great deal. It stands as a true example of the greatness of collective expertise and could be a posterboy of why the 'interwebz' are a good thing. Such specialist knowledge is extremely hard to come by and greatly appreciated - thank you all in advance for annoying questions I will pose to the forum. One day I hope to be able to contribute something useful to this community. Photos and queries to come shortly. This is probably the main (non Japanese) Board on every Nihonto aspects. You shall to have to sort out things, opinions, make up your mind and, in fine, take your own decision or form your own opinion. As all pseudo experts, we often fight each others as cats and dogs, but it is fun and you'll find a lot of things in the Kodogu section where, IMHO, you will encounter a lot of learned people.